Inspire better work habits. Focus your team. Get stuff done in the constantly connected workplace. As our workloads expand, attention has never been more valuable. Or more difficult to keep. 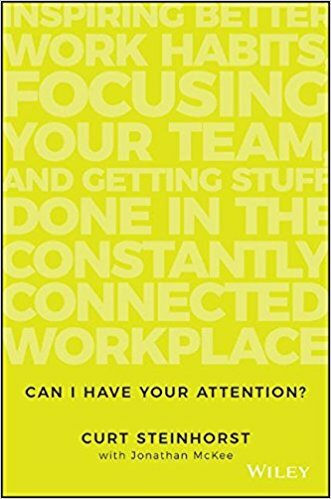 In Can I Have your Attention?, Curt Steinhorst shows business leaders how to cut through the noise and get their employees back to work. Curt has spent years helping Fortune 500 companies overcome distraction and achieve focus. With technology creating endless opportunites to “improve productivity”, people spend so much time responding to the interruptions that they’ve lost the ability to focus and do their jobs. Yet, the potential for harnessing the power of your team’s attention has never been greater–if you can capture it. Establish a Communication Compact, defining how, when, and why your team will communicate with each other. Create a “vault” to increase productivity, decrease stress, and boost your creativity. Achieve unmatched focus in the age of distraction. The smartphone isn’t going away. Learn the simple rules and guidelines that will improve focus and create the mental space needed for your people to work to their full potential.